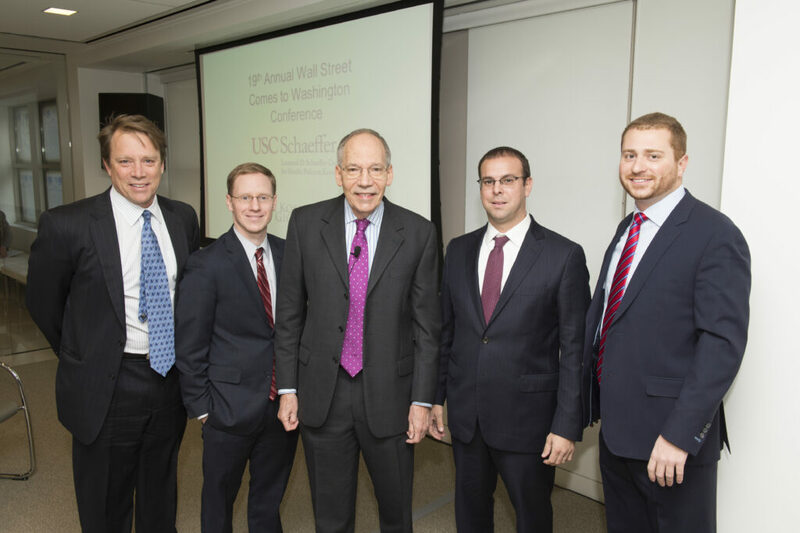 Paul Ginsburg, the director of Health Policy at USC’s Schaeffer Center for Health Policy and Economics, led a panel of bond and equity analysts in a wide-ranging discussion of the Affordable Care Act’s (ACA) impact on health care providers and insurers at the Annual Wall Street Comes to Washington Conference in Washington, D.C., on November 21. Ginsburg, who also holds the Norman Topping Chair at the Sol Price School of Public Policy, founded the conference almost 20 years ago to bridge the information gap between the policy world inside the Beltway and the world of Wall Street analysts. The panelists for this year’s conference were Ralph Giacobbe, director at Credit Suisse; James LeBuhn, senior director at Fitch Ratings; Carl McDonald, director and senior analyst at Citi Investment Research; and Nick Leventis, a private investor. The panel agreed that the U.S. Department of Health and Human Services’ (HHS) estimate of ACA marketplace enrollees for 2015 — 9 million to 9.2 million people — was low. McDonald said a recent survey of his company’s institutional investors indicated that enrollment could reach more than 11 million, an increase of around 4 million from 2014, including 2.5 million who were previously uninsured. The panelists said a key reason for the increase is that many small businesses stop offering health insurance and send workers into the exchanges to get coverage. In addition, the individual mandate requiring most people to have health insurance will boost enrollment in 2015 and 2016 as the financial penalty for noncompliance increases. Giacobbe said those coming into the exchanges in the next two years are expected to be younger and healthier than the initial enrollees. Despite a great deal of media attention, the analysts said health care providers and insurers are not overly concerned about the pending U.S. Supreme Court ruling on the legality of government-provided subsidies for participants in federal exchanges. “In my conversations with providers and plans, it seems like everybody is operating under the status quo and that whatever happens is somewhat irrelevant,” said Leventis, adding that HHS could “easily give some type of waiver to the states” to allow them to shift from a federal exchange to a state-based exchange that qualifies for subsidies if the ruling goes against the government. The panelists also predicted that HHS will grant more waivers to states to increase expansion of Medicaid and that eventually, every state will expand Medicaid. Commenting on the continued low annual growth in health care spending, the analysts attributed the slowdown mostly to the Great Recession, which strained household budgets and resulted in a significant drop in elective procedures being performed. Reduced reimbursements to hospitals resulting from tighter inpatient admission standards and the continuing trend of services moving to outpatient settings also likely contributed to slower spending growth. The panelists said a significant increase in high-deductible health plans has helped control costs because people have higher out-of-pocket costs and are thinking twice before going to the doctor. The panelists agreed health care spending growth is already starting to accelerate but declined to forecast how quickly spending will increase, particularly as the economy improves. LeBuhn said he anticipated far more price transparency and consumerism in health care over the next several years as individuals seek information to make cost comparisons for various procedures. “I think that is something that keeps a lot of providers up at night in terms of how they’re going to tackle that and, from a pricing standpoint, how they’re going to move from the wholesale side of the business into the retail side of the business,” he said. A major area of cost concern for insurers, the panelists said, is expensive biological specialty drugs, such as Solvadi, which can cure Hepatitis C. Leventis said current estimates suggest more than half the drugs waiting for Food and Drug Administration approval are specialty drugs. “With specialty pharma, you get one dose and you’ve hit your out-of-pocket max,” said McDonald, so normal cost-sharing requirements do little to control costs.